Today Rachel Hall, author of Heirlooms, is stopping by with a moving essay about her family history, its relationship to her new book, and the type of historical fiction she prefers to write and read. I hope you'll enjoy reading it, and I'd be interested to hear your thoughts in the comments. Heirlooms, winner of the G. S. Sharat Chandra Prize for Short Fiction, is published tomorrow by BkMk Press/The University of Missouri-Kansas City (trade pb, 190pp, $15.95). 1. Myth and legend, a man of great strength and courage, favored by the gods and in part descended from them 2. Any man admired for his courage, nobility, or bold deeds 3. Any man thought of as an ideal or model 4. The central male character in a novel, play, etc. 5. A central figure who played an admirable role in any important event or period. When I explain the family history behind my collection of linked stories, Heirlooms, people assume that my biological grandfather, a French Resistance fighter, is the protagonist. In fact, the character based on my grandfather makes only brief appearances in two stories, and in another his death is observed by a character who doesn’t know him. None of the stories in the collection are told from his point of view. In his life, my grandfather was a hero. He died fighting to free France of tyranny and fascism. This past summer, my mother, brother and I attended the yearly commemoration for him and the other political prisoners held in Montluc prison and executed on August 20, 1944. The solemn two-day event is attended by dignitaries from all over France and Europe. In short, a real hero, so why hadn’t I written about him more, given him a bigger role in Heirlooms? We are taught in literature classes that every story has a hero, after all. Had I missed an opportunity? Perhaps, but that wasn’t the book I wanted to write. As far as I know, the only thing that one might hold against my grandfather is the very thing that made him a hero: when he died for France, he left behind a little girl with wispy curls and dark, inquisitive eyes, my mother. Her biological mother had died of illness at the beginning of the war, so she’d been living with her paternal aunt and uncle, who would later adopt her. My grandfather’s absence in my mother’s life required others to step up, fill in, pick up the pieces. To me, her aunt and uncle were heroes, too—unsung, work-a-day, not the focus of history lessons or ceremonies, but heroes nonetheless. In the fiction that I write and read, I’m less interested in those who make history and drawn instead to those who live it—backstage, downstairs, on the sidelines, those overlooked in history textbooks. Put another way, not the stars, but the supporting cast. Thomas Mallon’s Henry and Clara beautifully illustrates this perspective or angle and reveals what fertile ground this is for the writer of historical fiction. In this novel, we witness Abraham Lincoln’s assassination from the point of view those seated with him in the Ford Theater balcony, Henry Rathbone, a young army officer and his fiancée, Clara Harris, daughter of New York Senator Ira Harris. These are people that most readers know little about, but who are, in Mallon’s capable hands, fascinating. Not surprisingly, they are forever changed by the events of April 15, 1865, and the reader is permitted to see how they cope—or don’t—in the aftermath. From this perspective, too, we understand the consequences of history. This is my focus in Heirlooms—the war, certainly, but also what came after for those who survived. Another historical novel that uses this approach to excellent effect is Emma Cline’s The Girls. Inspired by the Manson murders, The Girls is told from the perspective of Evie Boyd, a fourteen-year-old, who is attracted to the cult in the way that one might be drawn to any group: The other girls, when Evie encounters them in a park, seem sophisticated, cool, sure of themselves in a way that Evie envies. By chance, she doesn’t participate in the murder, but she easily could have, and the impact of the event will ripple through her life forever after. These characters’ proximity to historical event is a reminder, too, of how big a role chance and luck and happenstance play in the making of history and individual lives. Readers identify with characters like Evie or Clara and Henry because they resemble us. Indeed, they could be us! They have conflicts and concerns like ours—personal rather than national or international, but important to us, nonetheless. This identification allows us a kind of entry (time travel?) that brings history to life by reminding us that while much has changed since 1865 or 1944 or even 1969, humans want the same things—to be loved, for instance, and to love. This, to me, is the beauty of historical fiction. Heirlooms, by the way, is dedicated to the memory of mother’s adopted parents, my heroes. 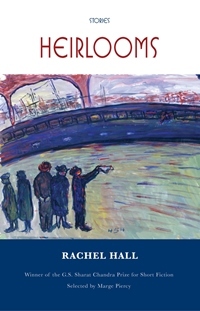 Rachel Hall's short stories and essays have appeared in a number of journals and anthologies including Black Warrior Review, Crab Orchard Review, Gettysburg Review, Fifth Wednesday and New Letters, which awarded her the Alexander Cappon Prize for Fiction. She has received other honors and awards from Lilith, Glimmer Train, the Bread Loaf Writers’ Conference, Ragdale, the Ox-Bow School of the Arts, and the Constance Saltonstall Foundation for the Arts. Hall is a Professor of English in the creative writing program at the State University of New York at Geneseo, where she holds the Chancellor’s Award for Excellence in Teaching. She lives in Rochester, New York with her husband and daughter. Visit her website at http://www.rachelhall.org. Lovely essay, thank you! And agreed, this is the kind of book I love. I like Rachel's appreciation for the unsung heroes - we all have a lot of them stretching back in our own heritage. Historical fiction sometimes helps to imagine what their lives were like. Thanks for the post! I've always enjoyed reading historical fiction about people on the sidelines, too - their perspectives are important and give new insight into history. Thanks for commenting!